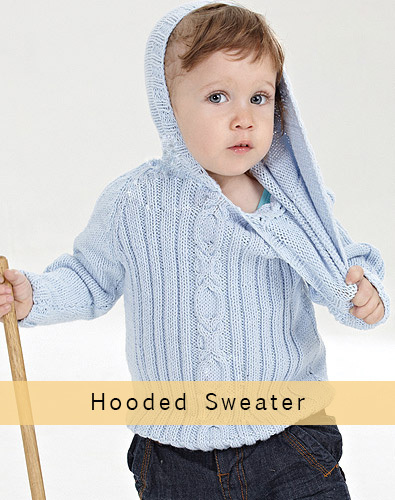 Are you decided to knit a sweater for your child. 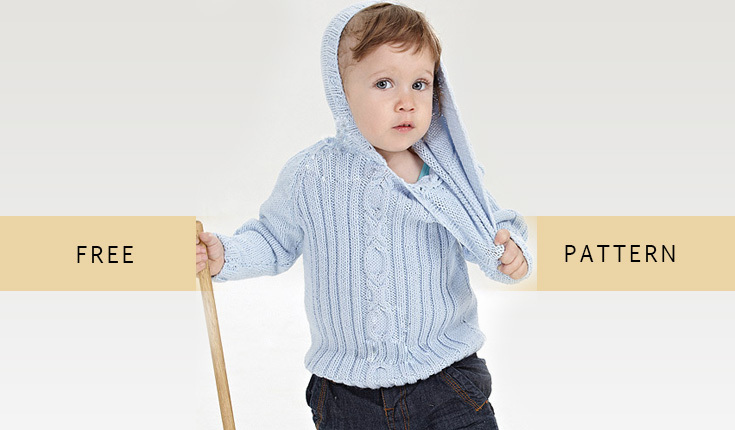 Here’s a great choice for you: We’re sharing a very nice hooded sweater pattern for boys. I don’t know if you’ve seen this pattern before, but this design is what I like most. The knitting pattern will not be difficult for experienced knitters because it has a very detailed instructions. If you have any questions about the hoodie, please contact me on my blog. Cast on 78 stitches. Rib 2×2 for 2 cm and change to knit stitch. Knit the body for 20 cm and work as follows at both sides for the armhole: knit 2, pick up 3 tog and cast off 3. When the body measures 35 cm, cast off remaining 38 stitches together and bind off. Cast on 78 stitches and rib 2×2 for 2 cm. 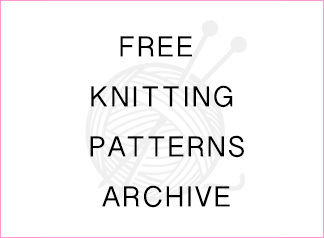 Work as follows on each 33 stitches at both sides: knit 11, purl 2, knit 2, purl 2, knit 3, purl 2, knit 2, purl 2, knit 3, purl 2, knit 2 and apply the model in the diagram on 12 stitches remaining in the middle. Knit the body for 20 cm and work as follows at both sides for the armhole: knit 2, pick up 3 tog and cast off 3. When the body measures 32 cm, cast off 18 stitches in the front middle part for the neck and continue knitting in 2 pieces. Cast off 4+3+2+1 stitches in every row at both sides of the neck. When the body measures 35 cm, finish off the stitches. Cast on 38 stitches and rib 2×2 for 2 cm. Knit each 11 stitches at both sides and work as follows on 16 stitches in the middle: purl 2, knit 3, purl 2, knit 2, purl 2, knit 3 and purl 2. Increase 1 stitch at both sides 8 times spacing 4 rows and reach to 54 stitches. Knit the sleeve for 20 cm and cast off 2 stitches at both sides 10 times for the armhole, spacing 4 rows. When the sleeve measures 35 cm, cast off remaining 14 stitches together and bind off. Knit the other sleeve in the same way. Cast on 120 stitches. Rib 2×2 for 2 cm and change to knit stitch. Knit each 50 stitches at both sides and work as follows on 20 stitches in the middle: purl 2, knit 2, apply the model in the diagram on 12 stitches, knit 2, purl 2. 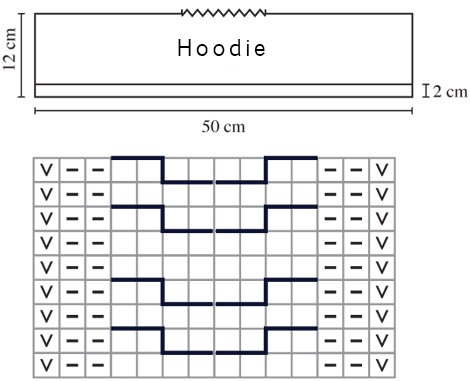 When the hoodie measures 12 cm, center the stitches and while knitting 40 stitches in the middle, keep each 40 stitches at both sides without knitting. Work cast-off as follows until the stitches at both sides finish: knit 40 stitches in the middle, return, cast off 1 from each 40 stitches at both sides; knit 40 stitches in the middle, return, cast off 1 stitch from 39 stitches at sides; knit 40 stitches…. Cast off remaining 40 stitches together and bind off. Sew around the neck.